For video clips of workshops and masterclasses visit our Youtube page. A whole week of classes by some of the greatest names in flamenco? Apply for the Codarts Flamenco Week. 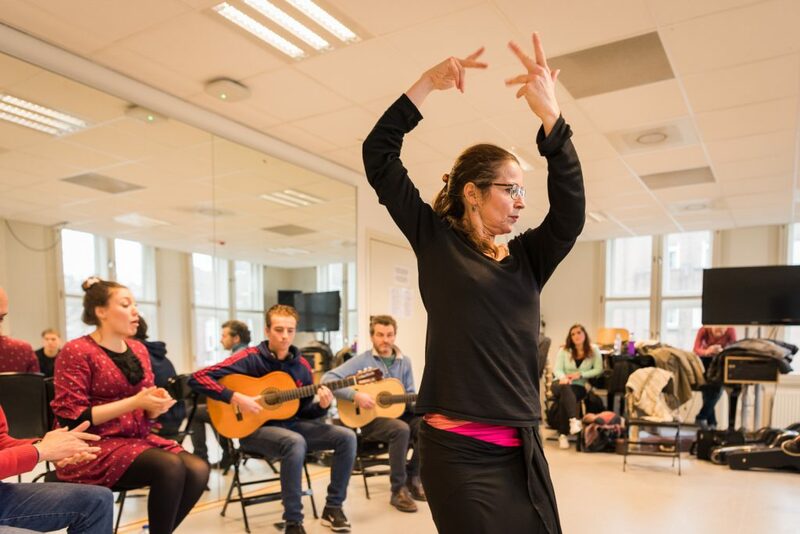 The Codarts flamenco program will prepare you for a very diverse professional practice. You will be trained as a soloist but also as accompanist of voice and dance (cante y baile) and as a teacher in the art of flamenco. You will work with a small and specialized group of teachers, under the artistic supervision of world renowned guitarist Paco Peña, who visits our school two days per month. You will work with him, as well as with the other teachers in our team on a one-to-one basis. We strongly believe that this individual approach is the best way to learn the art of flamenco playing, and it has been the basis of our program from the very first moment of teaching, in 1985. Flamenco contains a rich stock of nuances and subtleties, which go beyond the ability to produce the actual notes and greatly influence the sound that comes out at the end, ultimately defining its character. By working individually with the students the teachers promote this very important process, paying very serious attention to each aspect of technique and tone production, and undertaking a profound analysis of each flamenco form. The methodology used is designed in steps, from very basic ideas that must be fully assimilated and kept in the student’s consciousness, to gradually more complex developments. This methodology is not only central in your own development as a flamenco player, but also in your training to become a professional teacher yourself, transmitting your acquired skills and knowledge in a structured way to your own future students. Because the flamenco program is embedded in the wide variety of styles Codarts has to offer, you will also get a chance to explore how flamenco music can interact with other musical styles. You will experience this in some of the flamenco classes, but also in the project weeks that take place twice a year. For example, in 2016 we have performed the acclaimed Requiem for the Earth by Paco Peña. In this project students and teachers of the flamenco program joined forces with a student choir of the Music in Education program and a group of dancers of the Dance in Education program. Paco Peña invited some of the musicians from his own company and lead the project. The result was a spectacular performance and an unforgettable experience for all the students involved. 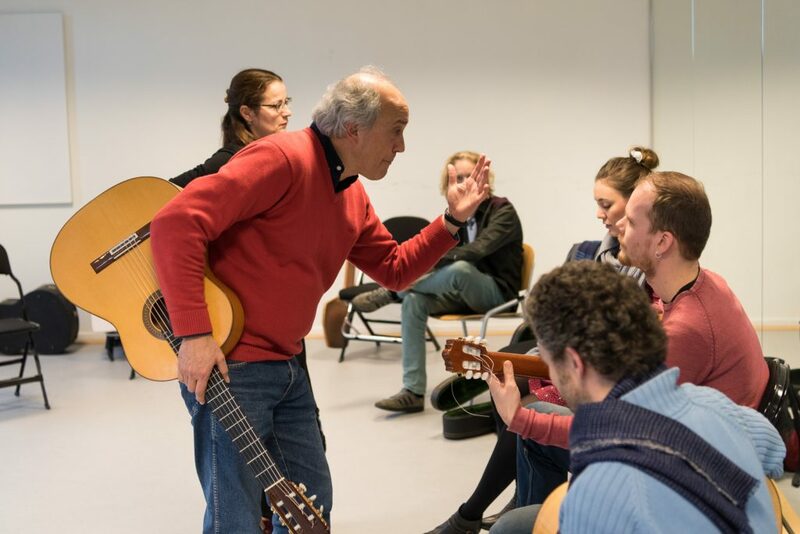 Together with the Dutch Flamenco Biennale, with whom we have a long standing collaboration, we organize workshops and masterclasses with world famous flamenco artists. The festival also gives our students the opportunity to perform for a large audience of flamenco lovers and make a first step into their professional practice already during their studies. The four year Bachelor program will train you in the wide flamenco repertoire and all the different flamenco guitar techniques. You will have individual lessons on your instrument and together with all the other flamenco students participate in the voice and dance practicum. Here you work with professional singers and dancers, to refine your skills as an accompanist, in all relevant flamenco forms. Next to that you will play in different ensembles. In the first two years these focus on how to play in a guitar ensemble, switching between playing melody parts (falsetas) or accompany them and at the same time looking at different possibilities of arranging for a group of guitars. But the main focus is to develop your awareness and skills that will help you to understand what ‘playing together’ really means and to effectively communicate during a performance. In the last two years of the program you will get the chance to exploit the rich musical variety that Codarts has to offer and to explore the various forms flamenco can take on in encounter with other musical disciplines. You will learn to incorporate instruments that are less common in a traditional flamenco setting, such as wind and string instruments and find a way to keep the essence of flamenco while arranging for such a group of players. Apart from the instrumental classes, you will alsohave theoretical subjects like flamenco history and analysis of the flamenco forms (and practice). In these modules you will learn about the background and context of flamenco music, but also very important, you will train to be critical in reviewing information, to compare sources and to make up your own informed opinion about what you see and read. Lastly, there are the classes that you follow with students from all different musical styles within the Bachelor of Music. Here you will find the general outline of the program. For your graduation you will prepare a concert program that displays your abilities in the different aspects of being a famenco player, in three parts: a solo part, a second part with ensemble, playing your own arrangements and a last part where you accompany a professional singer and dancer from the highest level, invited especially for this occasion. The Master program is a very open and individual program where you will have the chance to really work on your own profile as a musician. Central in your program will be your own Artistic Research. As part of the audition process you will draw up your research proposal, in which you describe what you want to research and develop in the two years of the master. Do you want to develop your own unique profile as a soloist? Or do you want to research the possibilities of translating the flamenco vocabulary to an instrument which is not so common in the tradition of flamenco? Maybe you have a study background in another style such as classical music or jazz and you want to find ways of integrating flamenco in your own musical background? Or do you want to figure out how to become the best accompanist possible? A lot is possible, but it all starts with your own unique question. Based on your research proposal we will see what package of subjects we can put together to support your Artistic Research in the best way possible. In most cases these will be individual lessons, but all group modules from the Bachelor course are open for Master students as well without any extra charge.